Build Change is working with local communities in disaster prone regions of the world to build culturally-acceptable homes that can stand up to the violent shaking of earthquakes and hurricane-force winds. 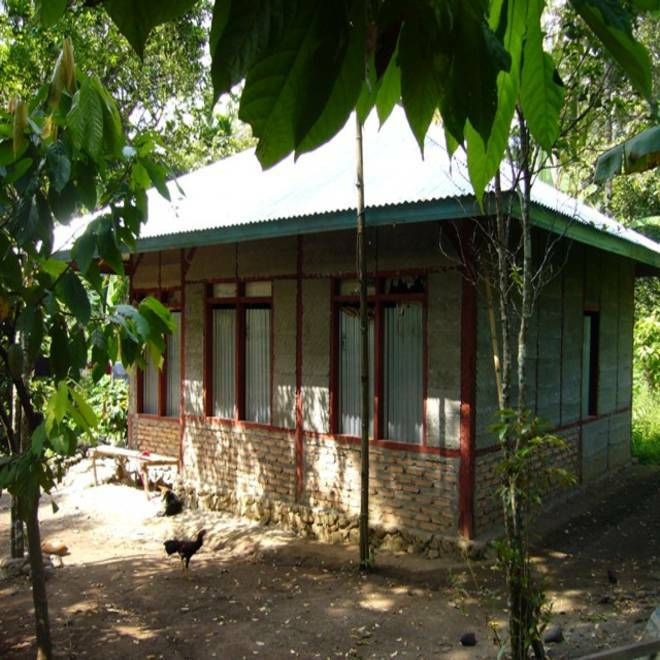 This disaster-resistant home was built in Indonesia. Earthquakes don't kill people, poorly built buildings do. The problem is that most disaster-proof, inexpensive housing technologies don't fit the cultural preferences of the communities that need them, according to a non-profit that's promoting a fix. "This is something that we can control and we can change if we know how to do it correctly," Elizabeth Hausler, the CEO and founder of Build Change, which has led post-disaster reconstruction efforts in China, Haiti, and Indonesia, told me last week. "Our mission is to reduce deaths and injuries from earthquakes when houses collapse, but there are so many financial and social features to that," Hausler said. "You've got to get the architecture right; it has to be appropriate for the climate and the culture." The approach contrasts with government and relief agency programs that rebuild communities with disaster-proof homes, such as sturdy geodesic domes, that don't fit in with the aesthetic or culture of the local community. As a result, the building technology isn't replicated after the help leaves town. "You completely miss the opportunity to train people to build something that they are familiar with … to improve on their preferred way of living," Hausler said. The trick, she's found, is to teach local communities what she calls the three Cs of disaster proofing: configuration, connections, and construction quality. 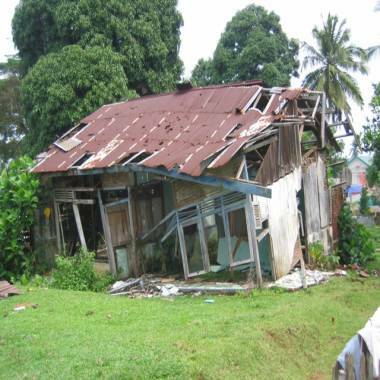 Many homes in disaster prone regions such as this one in Bengkulu, Indonesia, don't follow the three Cs: configuration, connections, and construction quality. Configuration relates to paying attention to a home's design plan and layout – keeping an eye out for things such as load-bearing walls in each direction of the home to improve durability and lightweight roofs. "In an earthquake, you don’t want a heavy roof, you don't want something heavy over your head," Hausler noted, adding the caveat that a lightweight roof in a hurricane-prone region needs to be tied down so it won't blow away. Another configuration to consider is the placement of windows and doors. These openings weaken the structural integrity of a wall that holds up the roof, but in a many regions of the world lots of open windows and doors are needed for climate control. Instead of saying only small windows are acceptable, Build Change promotes putting reinforcements in place. The second C, connections, focuses on the engineering principle that everything has be connected together to perform well in an earthquake or hurricane, Hausler explained. Walls connected to the foundation, roof connected to the walls, etc. The third C, construction quality, is about finding locally available building materials and qualified labor to do the job. That means laying bricks so that there's enough mortar in the spaces in between, for example, or soaking bricks in water before building a wall to improve its strength. Implementation of the three Cs is already standard practice in some parts of the world, including Japan, which was recently struck by a powerful earthquake and tsunami. As a result, Hausler's organization isn't planning to work there. Build Change empowers homeowners to make decisions about the floorplan of their new homes, a process that helps keep the sound engineering principles in the community long after the organization leaves town. 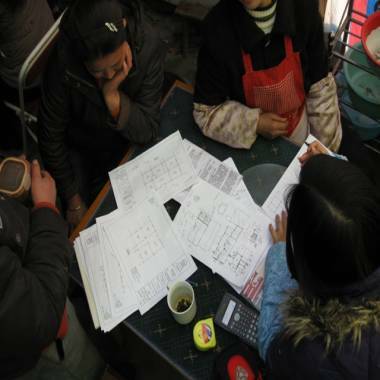 Here local stakeholders in China look at a blueprint. "Japan has some of the best engineers in the world and with some excellent building codes, so we really wouldn't add a lot of value there," she explained. "We add more value in a place like Haiti or a rural area in China where there really is a dearth of trained professionals and engineers who understand and enforce a simple building code." By working in disaster-prone regions that currently lack the engineering expertise to build sturdy homes with limited funding, Build Change hopes to empower local homeowners and builders to continue implementing the three Cs long after the organization leaves town. "That is the true test of sustainability," Hausler said. "That is our ultimate goal: that people continue to build earthquake resistant houses on their own without us and without any financial subsidy." Hausler was awarded the $100,000 Lemelson-MIT Award for Sustainability on May 10 in recognition of her engineering accomplishments and creation of a model that establishes sustainable earthquake resistant housing in the developing world. John Roach is a contributing writer for msnbc.com. Connect with the Cosmic Log community by hitting the "like" button on the Cosmic Log Facebook page or following msnbc.com's science editor, Alan Boyle, on Twitter (@b0yle).